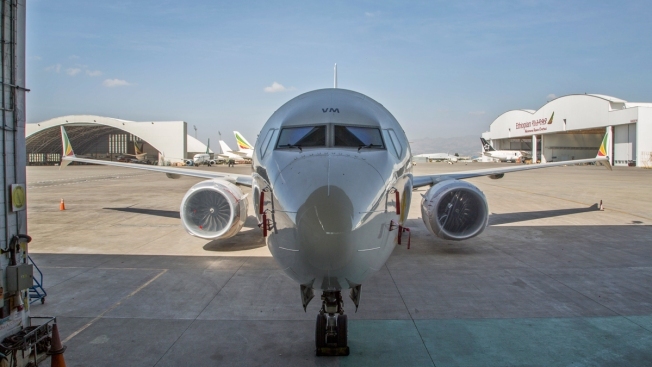 An Ethiopian Airlines Boeing 737 Max 8 sits grounded near a hangar at Bole International Airport in Addis Ababa, Ethiopia Saturday, March 23, 2019. Pilots of an airliner that crashed last month in Ethiopia initially followed Boeing's emergency steps for dealing with a sudden downturn of the nose of their plane but could not regain control, according to a published report. The Wall Street Journal reported Wednesday that pilots of the Ethiopian Airlines Boeing 737 Max turned off a flight-control system but still couldn't get the plane to climb. They turned the system back on and tried other actions before the plane crashed, the paper said, citing people familiar with preliminary findings of the crash investigation. In a statement, Boeing urged against speculating before the preliminary report and flight data from the plane are released. The Journal says the pilots' actions are still being evaluated by investigators but could raise questions about assertions made by Boeing and U.S. regulators in the aftermath of another Max crash in October that pilots could regain control simply by following steps to turn off a specific anti-stall system. Investigators are examining the crashes that killed all 346 aboard the 737 Max 8 jets operated by Indonesia's Lion Air and Ethiopian Airlines, including the role of a flight-control system called MCAS, which under some circumstances could automatically turn the plane's nose down to prevent an aerodynamic stall. The Journal reported that data downloaded from the plane's so-called black boxes indicates that the Ethiopian Airlines pilots followed recommendations to flip two switches that disconnected the system, but the plane kept sinking. They turned a manual wheel that adjusts the plane's tail, and used electric switches in an effort to climb, but that reactivated MCAS, which continued to push the plane's nose lower. Ethiopian investigators are expected to release their preliminary findings tomorrow. Boeing is the focus of investigations by the Justice Department, the Transportation Department's inspector general, and congressional committees. Investigations are also looking at the role of the Federal Aviation Administration, which certified the Max in 2017 and declined to ground it after the first deadly crash in October.